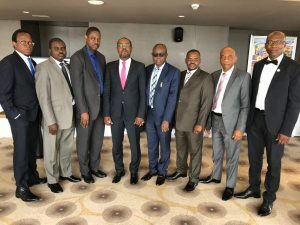 The West African Securities Regulators Association (WASRA) held its fourth Executive Council meeting on Tuesday, 23rd January 2018 in Rabat, Morocco on the sidelines of the fortieth Annual meeting and conference of the African Middle East Regional Committee(AMERC) of the International Organisation of Securities Commissions (IOSCO). The meeting which was in continuation of efforts towards building an enduring regulatory framework for the integration of the capital markets in the West African Sub Region, held with the full attendance of all the members of the Executive Council. The session, chaired by Mr. Mory Soumahoro, Executive Secretary of Le Conseil Regional de l’Epargne Publique et des Marches Financiers (CREPMF) Abidjan, focused on important issues including a review of the Association’s charter to reflect current market dynamics to meet emerging realities and improved liaison between the Association and stakeholders, including the Economic Community of West African States (ECOWAS), West African Capital Market Integration Council (WACMIC) and West African Monetary Institute, towards ensuring the required inclusiveness for a successful integration process; harmonization of the regulatory framework of member states for ease of cross border transactions and supervision, and capacity building. Other members present at the meeting were the chief executive officers of the Securities and Exchange Commissions of Nigeria and Ghana, Dr. Abdul Zubair and Rev. Daniel Ogbarmey Tetteh respectively. The Council reiterated its resolve to ensure a strong and workable structure to boost the integration aspiration, forestall regulatory arbitrage and enhance the orderly growth and development of the markets in the Sub Region. Bearing in mind the relevant principles of IOSCO, the global standard setter for securities regulation, the Council seeks, in addition to the foregoing major plans, to ensure transparent, fair and efficient markets, strengthen investor protection and confidence, and reduce the incidence of systemic risks within the sub Region. The Council resolved to speed up all necessary steps towards increased cross border transactions between players in the respective member countries. It noted the progress achieved so far, with satisfaction, and resolved to rededicate its energy towards improved collaborations between market players in the Sub Region in 2018. Speaking at the end of the meeting, the Acting Director General, SEC Nigeria, Dr. Abdul Zubair, noted the imperative of a cohesive collaboration between the relevant regulators, operators and other stakeholders in West Africa, and the need to ensure that adequate resources are devoted to building a strong and competitive regional market that will rank at par with the markets of other regions of the world, and more importantly, in the areas of transparency, disclosure, efficiency, accountability and indeed, investor protection. WASRA, established in 2015, is the recognized forum for capital markets regulators in the West African Sub Region.